You can now connect to your Face ID2 and Face ID3 to the FTDP V1.6.7. You will find the column Face when you are downloading/uploading users. 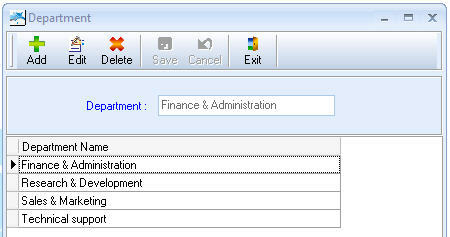 You can now define departments under the FTDP and assign users to different departments. You can choose to sort by department during download/upload user process. 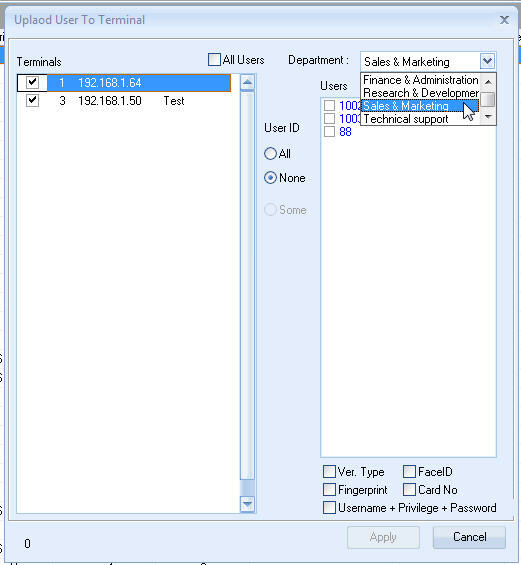 To download FingerTec Data Processor 1.6.7, click here. [Microsoft][ODBC Microsoft Access Driver] Selected collating sequence not supported by this operating system. I have office 2007 installed. Now, i have a simple work around but I do not get all the features of the real FTDP using it. i upgraded the mdb database to accdb and use that as the database. like i said, it works but some important features I cannot use. Okay, I downloaded the teamviewer file and it is currently active. Please provide a time and a time zone you are refering to when you give me the time to be on. Our support team are available at 9am to 6pm (Malaysian time), 7pm to 10pm (Malaysian time) and 12am to 6am (Malaysian time). Please refer at http://www.fingertec.com/ver2/skype/skype.html for our contact details. I will deal with you on this tomorrow ... At 8:30 pm Malaysia time. May I have your team viewer ID and password for me to do the remote checking? http://www.fingertec.com/newsletter/Nov2010/TIPS-02.html for the TCMSv2 Viewer FAQs. I will give you the ID there. Okay, for anyone else who has experienced the same problem as I did, there is a solution for it...Well I haven't tried it or confirmed that it works but Aidid assured me that this solution will work. You need to install East Asia and complex scripts Languages. It will prompt to have the windows CD in the drive. Thank you Aidid, hope this helps others. I am confirming that the solution in my previous post worked. The error is no more. For a small and simple software it does its job with work around but it has a long way to come. I can't get to download users via ip network but when i added them via flash, I got tru. So, any help with that would be nice. You can refer at page 8 to 9 in the FTDP manual for more details on downloading user by using TCP/IP connection. In case still having problem, you can arrange the team viewer for us to do the checking remotely. Please re-install the FTDP software with the latest version setup. Kindly right click at the setup file and select run as administrator to install the FTDP software. In case still getting the same problem, please provide team viewer ID for us to do the checking remotely. I'm running Windows 7 x86. Referring to the error message, it is cause by TCMSv2 Installer problem but it will not affects the perfomance of your TCMSv2 Software. To fix it, you can just click OK on the error message and Finish the installation. We will fix this problem on new TCMSv2 Installer. Sorry for any inconvenience cause and feel free to contact us if you need further clarification. Well it solved after i ran a few times of repair. No more error. Is it recommended to continue? Does TCMS require any pdf software to preview documents like Attendance Sheet? The preview window closed immediately right after i clicked on Preview. Basically TCMSv2 not require any pdf file to preview any document like Attendance Sheet. Referring to the problem, please generate your Attendance sheet at Attendance tab > Generate. In the same time, please ensure you select the valid date and user ID before you preview any report.